That much-talked-about Requiem Mass by Joan Brudieu (ca.1520-1591) is now online in full. Listen for the heartbeat underneath the polyphonic structure on top, beautifully crafted by the choir under the direction of Wilko Brouwers. The same Mass has Dies Irae sung in octave alternation. Much more here. In fact, it is an entire evening of thrilling listening. 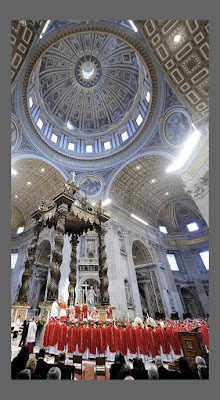 Readers may recall the March 22nd NLM story which detailed the restoration of the Cappella Paolina in the Apostolic Palace. 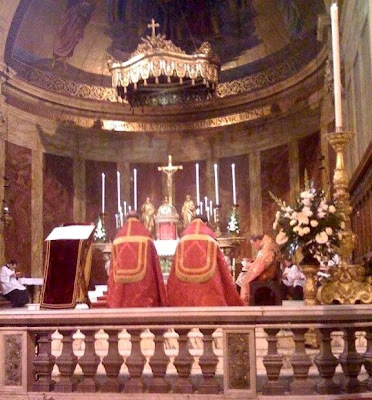 In that story we reported that "...the Vatican has announced that the rearrangement of the liturgical space carried out under Pope Paul VI after the Second Vatican Council will be almost completely reversed, restoring most of the furnishings to their original place..." including the return of the original marble altar, but as a freestanding altar. The restoration also included work on Michelangelo frescoes depicting the Conversion of St. Paul and the Crucifixion of St. Peter. 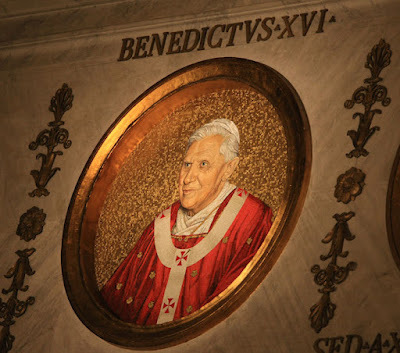 Pope Benedict XVI will inaugurate the restored chapel this Saturday with the celebration of Vespers in the chapel. The NLM will endeavour to bring you coverage of this event. 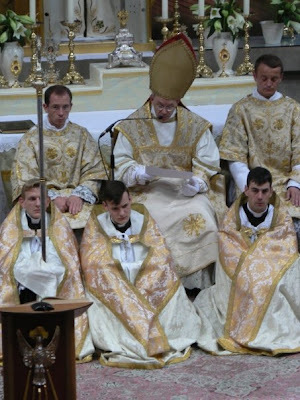 For those of you who have never had an opportunity to attend a Solemn Pontifical Mass in the usus antiquior, you may be interested to know that the Canons Regular of St. John Cantius, along with Bishop Joseph Perry, an auxiliary of the archdiocese of Chicago, will be celebrating one live on EWTN tomorrow, July 1st, on the Feast of the Most Precious Blood in the calendar of the usus antiquior. 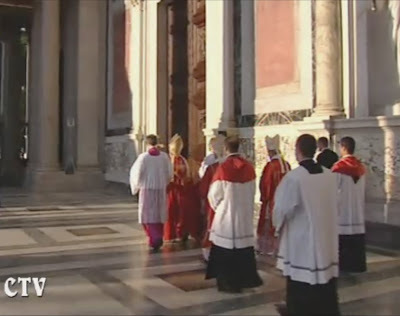 The Mass will begin airing at 8:00am EST (and will be re-aired at midnight EST). 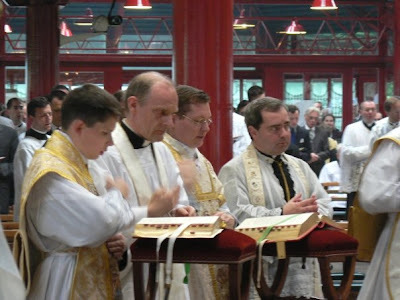 The Schola will be comprised of the Poor Clare nuns and the Canons Regular of St. John Cantius. 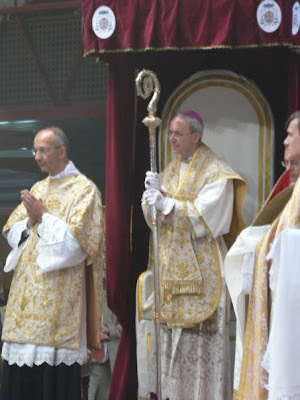 In addition to the Pontifical Mass, Bishop Perry and Fr. Frank Phillips of the Canons Regular will be on the programme, EWTN Live with guest host, Fr. Joseph Wolfe, MFVA, to discuss the re-invigoration of the St. John Cantius parish. This will air tomorrow at 8:00pm EST. Finally, on Friday, July 3, 2009 at 8:00am EST, Fr. Frank Phillips, C.R. 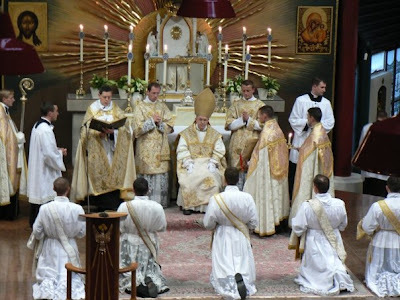 and the Canons Regular will celebrate the modern Roman liturgy in the chapel of the EWTN Studios in Irondale. 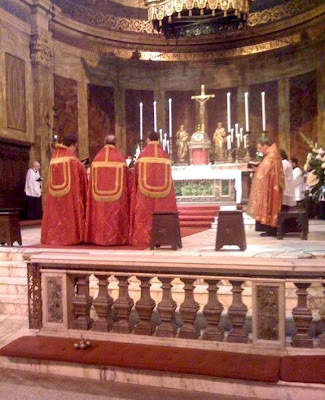 The brothers of the Canons Regular of St. John Cantius will sing Kyriale IV and the Gregorian chant propers from the Gradulae Romanum for this festal Mass of St. Thomas the Apostle. 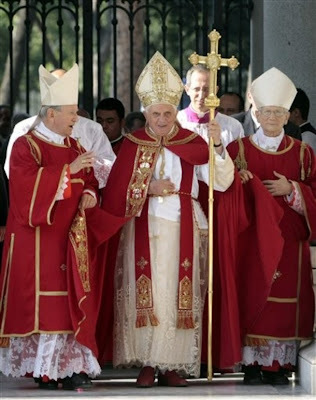 For those interested in one or all of these events, EWTN can be watched live on the internet by clicking on the "Television" menu and going to "Live TV" in either English of Spanish. 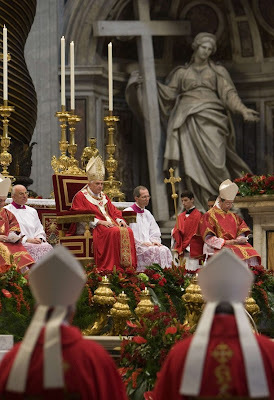 It's a common error made in contemporary literature on sacred music to suggest that style doesn't matter, even though the Second Vatican Council clearly speaks of the "qualities proper to genuine sacred music." In fact, at least one defunct document issued in 1982 ("Music in Catholic Worship") explicitly claimed that we cannot judge the style of music as such. The replacement document, "Sing to the Lord," does not repeat the false claim, which was a great relief to the competent musicians involved. However, at some stage of the drafting of "Sing," someone snuck in a phrase that admits the sentiment that style doesn’t matter. Such is the nature of committee work in which everyone gets a piece of the action. 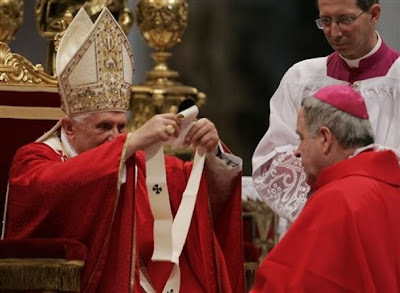 The phrase in paragraph 71 reads: "…the Church seeks to employ only that which, in a given style, meets the ritual-spiritual demands of the Liturgy." That seems like a pretty small nail on which to hang the hat of rock music, overt in its secular beats and emotionalism, but, sure enough, that is what we are seeing. In any article in the June 2009 issue of Pastoral Music, a piece called "Praise and Worship Music: Can We Use it at Mass," by Ed Bolduc who is associated with a Christian publishing business, this statement is quoted to justify a rousing defense of P&M music. He admits that the music is "simple," but says that is fine since it is focused on the "individuals' personal, intimate relationship with God" and can be played by musicians "with even a minimal knowledge of their instrument." It is suitable because it address "specific needs" and "speaks to the heart." Further, it is suitable liturgical music because it encourages "vibrant, participatory, singing and worship." Striking, isn't it? A magazine entirely devoted to the issue of Catholic music, in the same issue that discusses chant with a high degree of competence, would hand all musicians of the world a blank check to sing and play whatever they want provided it speaks to people in some way and gets people to sing. By that standard, no music, no style, no text, can be excluded from Mass, so of course Praise and Worship music is suitable too. 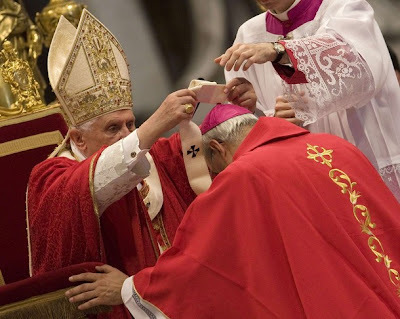 One would have no idea that there is any legislation governing the choice of music at Mass, though Popes have been written on this material for nearly 2000 years. The writer of this article feels free to completely ignore the whole of this writing and the whole of tradition, which is free to do, but it strikes me as the height of irresponsibility for this article to be published by a reputable Catholic publication. Nonetheless, let's take on the notion that anything and everything can be played and sung at Mass. St. Pius the X summarized all the teachings of the Church by delineating three marks of sacred music: it is holy, beautiful, and universal. Gregorian chant is therefore the model and ideal. Rather than explain each directly, it might be more fruitful to explain this by reference to building a bridge, the very physical structure that stretches over a body of water to road to allow transport above ground. Let us say that we decide that a bridge has three marks: it design must obey geometric laws governing structure so that it will do its job, it must be made of solid material so that it can withstand wear, and it must be aesthetically pleasing. The point about geometry is roughly analogous with the principle of universality: the laws of geometry are universal principles that no bridge can do without. In the same sense, sacred music should obey the dictate of universality, possessing quality that elicits a sense of the sacred worldwide. The point about material integrity—the bridge can't be made of Styrofoam or paper but must have steel or thick wood enforcement—is roughly analogous to the principle of holiness in music. Without it, the music serves some other purpose but not a liturgical one. Holiness means to be set apart from things of the world to serve a particular godly purpose. If the music is not "made" with that quality, it cannot serve that purpose. The final principle of bridge building concerns aesthetics. It is large and imposing and a permanent feature of the landscape. Without beauty, it can still do its practical functional work but it will be an eyesore. So it makes sense to insist on that quality since the bridge is not just providing transportation. It is also something we experience with this senses in the same way that we experience music with the senses. So there is the analogy: music must be holy (be made of sound material), beautiful (aesthetically pleasing with an order that elevates our senses), and universal in its appeal to the best in everyone (obey universal norms that transcend time and place). Now, just imagine if someone came along and said, you know, all these old strictures are just the work of fuddy-duddies, rules imposed by people who don't understand the contemporary bridge-building impulse. Bridges don't have to obey the laws of geometry. They don't have to be made of anything in particular. And the standards of what is aesthetically pleasing are so various as to resist any attempts at objectification. What would happen to a bridge that in the building of which ignored all these principles? I think we know. Cars would drive on the bridge without any real assurance of safety in getting from here to there. Depending on the degree to which the rules were ignored, they might no make it at all. Meanwhile, the bridge would in fact be an eyesore. The person behind the project would not end as a community hero. He would probably develop the reputation as a fool and rightly so: anyone who attempts to serve a community of traveler while willy-nilly ignoring established rules has little to offer anyone. So it is with music at Mass. There are principles. There are rules. These are essential in accomplishing the task at hand. It is not enough that people's hearts are in the right place and that the music moves them in some emotional sense. It must conform to the principles governing the task at hand. Now, I admit here that there is plenty of room for creativity in the application of these principles. No question about it. That is a good thing. If every bridge looked the same or operated the same way, the world would become rather boring. But that creativity must occur within an established framework else the job would not and could not be said to be well done. A song singled out by Mr. Bolduc as particularly appropriate for Mass is "Open the Eyes of My Heart, Lord" by Paul Baloche. I've not heard this song before. But listening to it now for the first time, I hear bongos, a trap set, electric guitars, a simplistic musical and textual structure, a rock-beat meter, and familiar rock riffs throughout, along with an ego completely unleashed from all decorum and discipline. It might be a good thing that it has a vaguely religious message (a guy wants to see God) but that alone is not enough. It does not serve the purposes of liturgical music. And for anyone with a well-formed liturgical conscience, this music will introduce scandal to many at Mass. So, no, it does not qualify. Based on this sample, I would say that Ed Bolduc is wrong. Praise and Worship music should not be used at Mass, even if his firm of World Library Publications sells the sheet music. Here is Fr. Jeffrey Keyes of St. Edward Catholic Church, Newark, explaining the rationale of his Minimum Parish Repertoire that is part of the school curriculum. Here is an initial round of recordings of the music at the Sacred Music Colloquium in Chicago, a gathering of 250 musicians along with Masses in the ordinary and extraordinary form, including one celebrated by Cardinal George. The Haydn Mass included orchestra. The Requiem Mass used a polyphonic ordinary written 500 years ago but never before heard in North America. 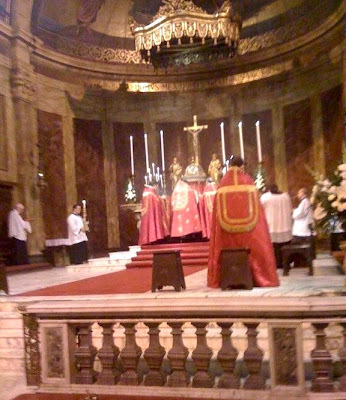 The final Mass was the Byrd Mass for 5 voices. All readings were sung. All propers were sung in Gregorian chant. 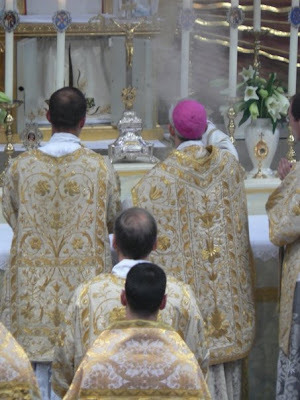 The Masses themselves were expertly crafted with ceremonial detail provided by priests and brothers of St. John Cantius. Many more recordings will posted, along with video and interviews. All are completely open source. Click them to your hard drive. Share them. Use them for any purpose you want to use them for without asking any permission. The same is true for all scores which are online for free download. As a funny side note, on the last night of the conference, I notice a new conference arriving on campus, mostly people in the 70s and 80s. It looked like about 40 people arriving to discuss spiritual renewal. All very nice and the attendees seemed like sweet people. But to my surprise, I was looking through the latest issue of Pastoral Music under events and I saw that very conference listed as something to attend. There was no note about age, so it turns out not to be an age specific event. Meanwhile, there was not one word about the Sacred Music Colloquium, in this publication wholly devoted to Catholic music. The unannounced Colloquium was so large that it nearly took over the campus. And so it goes in the course of human events. Continuing our excursion into one of my latest illustration commissions, a sequence of images depicting events from the life of St. Bernard done for a client in New York City, here is a view of the central panel, depicting the saint in glory. Matthew Alderman. S. Bernard of Clairvaux. Ink. June 2009. Private Collection, New York City. Above his head, two angels bear the coat of arms of the Cistercian Order, while below, St. Bernard bears his crozier in his right hand, the abbatial veil curling around its shaft. His posture is derived in part from Zurbarán's marvelous painting of St. Francis upright in the tomb (ca. 1630/34). Numerous smaller details depict the saint's various attributes in discrete ways--the bees worked into the foliage of his crozier-head, representing his title of Doctor Melifluus; the arms of the Templar Order, whose rule he wrote, on the knob of its staff; another shield depicting the mitres of the three dioceses he rejected; an angel presenting him with a model of the abbey of Clairvaux, and a scroll inscribed with the opening passage of the Canticle of Canticles, on which he frequently preached. For those of you who missed it, the first installment of this series can be found here. Tomorrow I will share the final panel in the sequence, depicting Christ's revelation of the Holy Shoulder to the saint. St. Paul Parish in South Philadelphia marked the closing of the Year of St. Paul with a solemn celebration of Mass in the Extraordinary Form (Missa Cantata) celebrating the Solemnity of SS Peter and Paul. Approximately 350 people were in attendance for the Mass including many visitors who came as pilgrims for the close of the Pauline Year. In addition to the Propers and various motets by Perosi and Ravenello provided by a small schola, the Missa de Angelis was sung for the Ordinary. Mr. Nicholas Beck directed the Schola and Mr. Robert Ridgell was the organist. Father Gerald P. Carey, Pastor celebrated the Mass and announced to all present that beginning in the Fall, there will be a sung TLM every week at 12:00 Noon beginning on October 25 (Feast of Christ the King). Father Carey is still very new to the Extraordinary Form and is asking everyone for their prayers in this big step forward. 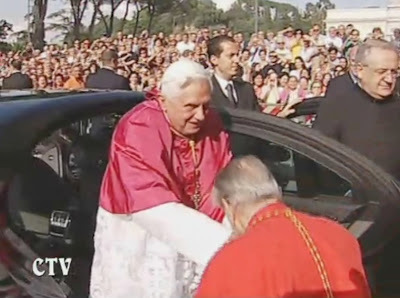 Please remember him and all of his parishioners as they embark upon this endeavor. 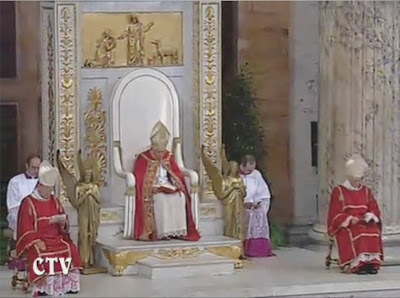 This morning, Pope Benedict celebrated a Papal Mass for the Feast of the Holy Apsotles Peter and Paul. 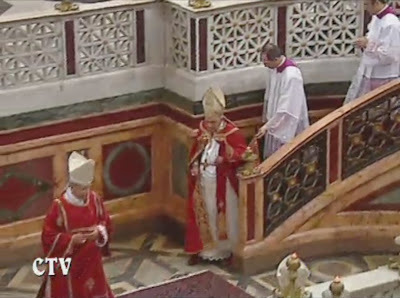 During this Mass, he imposed the pallia on the metropolitan archbishops appointed since the same date last year. 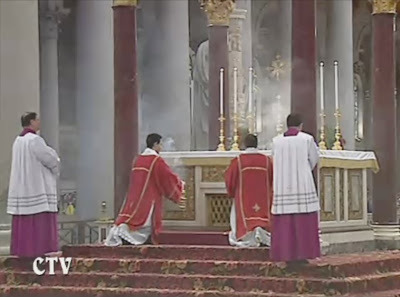 While the NLM was unable to follow the Mass, you can watch a video of the Mass at French kto TV here, and here are some images from Daylife (click to enlarge). 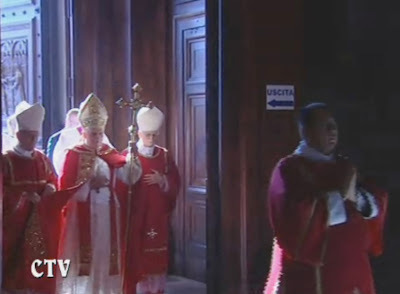 The Cardinal Deacons are Angelo Comastri, President of the Fabric of Saint Peter, and Giovanni Lajolo, President of the Governorate of Vatican City State. I recently completed a large commission for an original piece of art for a client in New York City, a series of three interrelated illustrations of scenes from the life of St. Bernard. I hope to share each of the three panels with our readers over the next few days, concluding with the three placed together in context. Matthew Alderman. 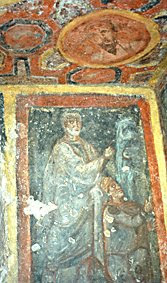 S. Bernard Healed by the Virgin. Ink. June 2009. Private Collection, New York City. 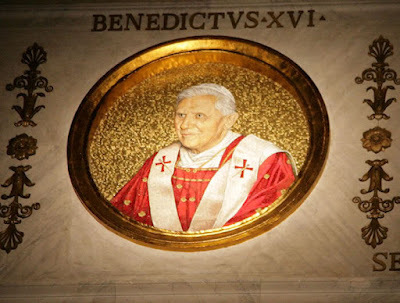 One day, however, his [St. Bernard's] sufferings became so excessive that, no longer able to bear up against them, he called two of his brethren and begged them to go to the church and ask some relief of God. The brethren, touched with compassion, prostrated themselves before the altar, and prayed with great abundance of tears. During this time, Bernard had a vision which ravished him with delight. The Virgin Mary, accompanied by St. Lawrence and St. Benedict, under whose invocation he had consecrated the two side altars of his church, appeared to the sick man. "The serenity of their faces," says William of St. Thierry, "seemed the expression of the perfect peace which surrounds them in Heaven." They manifested themselves so distinctly to the servant of God that he recognized them as soon as they entered his cell. The Virgin Mary, as well as the two saints, touched with their sacred hands the parts of Bernard's body where the pain was most acute; and, by this holy touch, he was immediately delivered from his malady; and the saliva which till then had been flowing from his mouth in a continuous stream ceased at the same time. I used this commission, in part, to experiment with some stylistic elements derived from the work of the Irish stained glass designer Harry Clarke, whose work has appeared here in the past. The edging of sea-shells along the Virgin's cloak is partially inspired by Clarke's work, and also refers specifically to St. Bernard's devotion to the Virgin as Star of the Sea; the saint is thought to be the first to have invoked the Virgin under this title. The star motif on the Virgin's morse also recalls this. St. Bernard and St. Lawrence are visible in the background, with the ill saint curled up at the bottom of the panel. Tomorrow, I will post an image of the central panel, showing the saint surrounded by his attributes. I address my cordial greeting to each one of you. 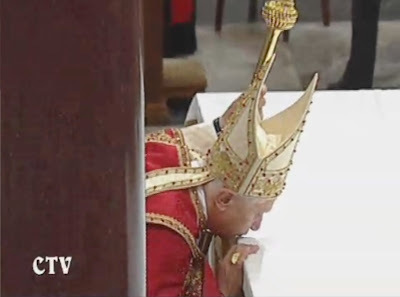 In particular, I greet the Cardinal Archpriest of this Basilica and his collaborators, I greet the Abbot and the Benedictine monastic community; I also greet the Delegation of the Ecumenical Patriarchate of Constantinople. The commemorative year for the birth of St Paul ends this evening. 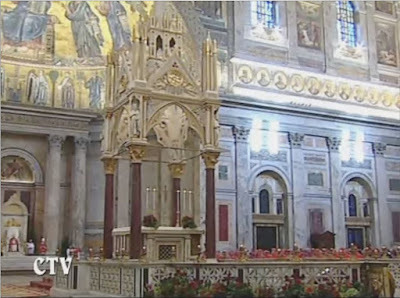 We have gathered at the tomb of the Apostle whose sarcophagus, preserved beneath the papal altar, was recently the object of a careful scientific analysis. A tiny hole was drilled in the sarcophagus, which in so many centuries had never been opened, in order to insert a special probe which revealed traces of a precious purple-coloured linen fabric, with a design in gold leaf, and a blue fabric with linen threads. Grains of red incense and protein and chalk substances were also found. In addition, minute fragments of bone were sent for carbon-14 testing by experts unaware of their provenance. The fragments proved to belong to someone who had lived between the first and second centuries. This would seem to confirm the unanimous and undisputed tradition which claims that these are the mortal remains of the Apostle Paul. All this fills our hearts with profound emotion. In recent months, many people have followed the paths of the Apostle the exterior and especially the interior paths on which he travelled in his lifetime: the road to Damascus towards his encounter with the Risen One; the routes of the Mediterranean world which he crossed with the torch of the Gospel, encountering contradiction and adherence until his martyrdom, through which he belongs for ever to the Church of Rome. It was to her that he also addressed his most important Letter. The Pauline Year is drawing to a close but what will remain a part of Christian existence is the journey with Paul with him and thanks to him getting to know Jesus, and, like the Apostle, being enlightened and transformed by the Gospel. And always, going beyond the circle of believers, he remains the "teacher of the Gentiles", who seeks to bring the message of the Risen One to them all, because Christ has known and loved each one; he has died and risen for them all. Therefore let us too listen to him at this time when we are solemnly beginning the Feast of the two Apostles who were bound to one another by a close bond. It is part of the structure of Paul's Letters always in reference to the particular place and situation that they first of all explain the mystery of Christ, they teach faith. The second part treats their application to our lives: what ensues from this faith? How does it shape our existence, day by day? In the Letter to the Romans, this second part begins in chapter 12, in which the Apostle briefly sums up the essential nucleus of Christian existence in the first two verses. What does St Paul say to us in that passage? First of all he affirms, as a fundamental thing, that a new way of venerating God began with Christ a new form of worship. 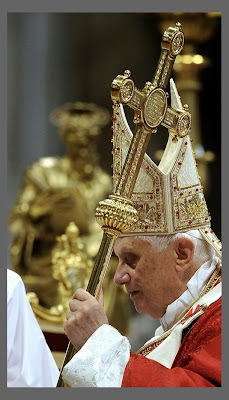 It consists in the fact that the living person himself becomes adoration, "sacrifice", even in his own body. It is no longer things that are offered to God. It is our very existence that must become praise of God. But how does this happen? In the second verse we are given the answer: "Do not be conformed to this world but be transformed by the renewal of your mind, that you may prove what is the will of God..." (12: 2). The two decisive words of this verse are "transformed" and "renewal". We must become new people, transformed into a new mode of existence. The world is always in search of novelty because, rightly, it is always dissatisfied with concrete reality. Paul tells us: the world cannot be renewed without new people. Only if there are new people will there also be a new world, a renewed and better world. In the beginning is the renewal of the human being. This subsequently applies to every individual. Only if we ourselves become new does the world become new. This also means that it is not enough to adapt to the current situation. The Apostle exhorts us to non-conformism. In our Letter he says: we should not submit to the logic of our time. We shall return to this point, reflecting on the second text on which I wish to meditate with you this evening. The Apostle's "no" is clear and also convincing for anyone who observes the "logic" of our world. But to become new how can this be done? Are we really capable of it? 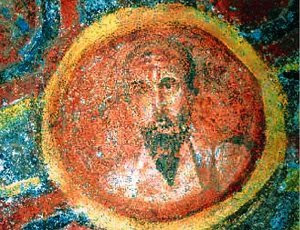 With his words on becoming new, Paul alludes to his own conversion: to his encounter with the Risen Christ, an encounter of which, in the Second Letter to the Corinthians he says: "if anyone is in Christ, he is in a new creation; the old has passed away, behold, the new has come" (5: 17). This encounter with Christ was so overwhelming for him that he said of it: "I... died..." (Gal 2: 19; cf. Rm 6). He became new, another, because he no longer lived for himself and by virtue of himself, but for Christ and in him. In the course of the years, however, he also saw that this process of renewal and transformation continues throughout life. We become new if we let ourselves be grasped and shaped by the new Man, Jesus Christ. He is the new Man par excellence. In him the new human existence became reality and we can truly become new if we deliver ourselves into his hands and let ourselves be moulded by him. Paul makes this process of "recasting" even clearer by saying that we become new if we transform our way of thinking. What has been introduced here with "way of thinking" is the Greek term "nous". It is a complex word. It may be translated as "spirit", "sentiments", "reason", and precisely, also by "way of thinking". Thus our reason must become new. This surprises us. We might have expected instead that this would have concerned some attitude: what we should change in our behaviour. But no: renewal must go to the very core. Our way of looking at the world, of understanding reality all our thought must change from its foundations. The reasoning of the former person, the common way of thinking is usually directed to possession, well-being, influence, success, fame and so forth. Yet in this way its scope is too limited. Thus, in the final analysis, one's "self" remains the centre of the world. We must learn to think more profoundly. St Paul tells us what this means in the second part of the sentence: it is necessary to learn to understand God's will, so that it may shape our own will. This is in order that we ourselves may desire what God desires, because we recognize that what God wants is the beautiful and the good. It is therefore a question of a turning point in our fundamental spiritual orientation. God must enter into the horizon of our thought: what he wants and the way in which he conceived of the world and of me. We must learn to share in the thinking and the will of Jesus Christ. It is then that we will be new people in whom a new world emerges. Paul illustrates the same idea of a necessary renewal of our way of being human in two passages of his Letter to the Ephesians; let us therefore reflect on them briefly. In the Letter's fourth chapter, the Apostle tells us that with Christ we must attain adulthood, a mature faith. We can no longer be "children, tossed to and fro and carried about with every wind of doctrine..." (4: 14). Paul wants Christians to have a "responsible" and "adult faith". The words "adult faith" in recent decades have formed a widespread slogan. 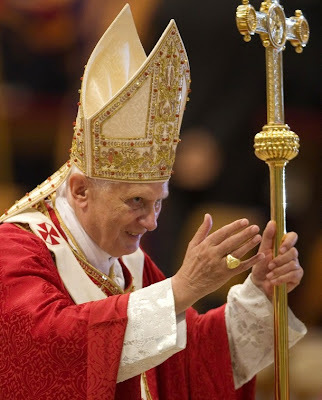 It is often meant in the sense of the attitude of those who no longer listen to the Church and her Pastors but autonomously choose what they want to believe and not to believe hence a do-it-yourself faith. 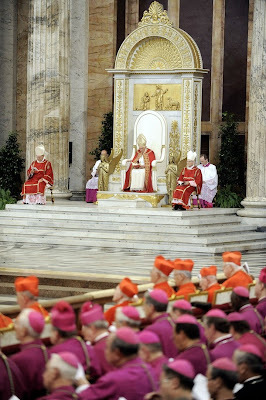 And it is presented as a "courageous" form of self-expression against the Magisterium of the Church. In fact, however, no courage is needed for this because one may always be certain of public applause. Rather, courage is needed to adhere to the Church's faith, even if this contradicts the "logic" of the contemporary world. This is the non-conformism of faith which Paul calls an "adult faith". It is the faith that he desires. On the other hand, he describes chasing the winds and trends of the time as infantile. Thus, being committed to the inviolability of human life from its first instant, thereby radically opposing the principle of violence also precisely in the defence of the most defenceless human creatures is part of an adult faith. It is part of an adult faith to recognize marriage between a man and a woman for the whole of life as the Creator's ordering, newly re-established by Christ. Adult faith does not let itself be carried about here and there by any trend. It opposes the winds of fashion. It knows that these winds are not the breath of the Holy Spirit; it knows that the Spirit of God is expressed and manifested in communion with Jesus Christ. However, here too Paul does not stop at saying "no", but rather leads us to the great "yes". 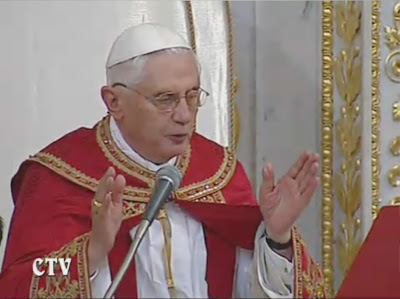 He describes the mature, truly adult faith positively with the words: "speaking the truth in love" (cf. Eph 4: 15). The new way of thinking, given to us by faith, is first and foremost a turning towards the truth. The power of evil is falsehood. The power of faith, the power of God, is the truth. The truth about the world and about ourselves becomes visible when we look to God. And God makes himself visible to us in the Face of Jesus Christ. In looking at Christ, we recognize something else: truth and love are inseparable. In God both are inseparably one; it is precisely this that is the essence of God. For Christians, therefore, truth and love go together. Love is the test of truth. We should always measure ourselves anew against this criterion, so that truth may become love and love may make us truthful. Another important thought appears in this verse of St Paul. The Apostle tells us that by acting in accordance with truth in love, we help to ensure that all things (ta pánta) the universe may grow, striving for Christ. On the basis of his faith, Paul is not only concerned in our personal rectitude nor with the growth of the Church alone. He is interested in the universe: ta pánta. The ultimate purpose of Christ's work is the universe the transformation of the universe, of the whole human world, of all creation. Those who serve the truth in love together with Christ contribute to the true progress of the world. Yes, here it is quite clear that Paul is acquainted with the idea of progress. Christ his life, his suffering and his rising was the great leap ahead in the progress of humanity, of the world. Now, however, the universe must grow in accordance with him. Where the presence of Christ increases, therein lies the true progress of the world. There, mankind becomes new and thus the world is made new. Paul makes the same thing clear from yet another different perspective. In chapter three of the Letter to the Ephesians he speaks to us of the need to be "strengthened... in the inner man" (3: 16). With this he takes up a subject that earlier, in a troubled situation, he had addressed in the Second Letter to the Corinthians. "Though our outer nature is wasting away, our inner nature is being renewed every day" (4: 16). The inner person must be strengthened this is a very appropriate imperative for our time, in which people all too often remain inwardly empty and must therefore cling to promises and drugs, which then result in a further growth of the sense of emptiness in their hearts. This interior void the weakness of the inner person is one of the great problems of our time. Interiority must be reinforced the perceptiveness of the heart; the capacity to see and to understand the world and the person from within, with one's heart. We are in need of reason illuminated by the heart in order to learn to act in accordance with truth in love. However, this is not realized without an intimate relationship with God, without the life of prayer. We need the encounter with God that is given to us in the sacraments. And we cannot speak to God in prayer unless we let him speak first, unless we listen to him in the words that he has given us. In this regard Paul says to us: "Christ may dwell in your hearts through faith; that you, being rooted and grounded in love, may have power to comprehend with all the saints what is the breadth and length and height and depth, and to know the love of Christ which surpasses knowledge" (Eph 3: 17ff.). With these words Paul tells us that love sees beyond simple reason. 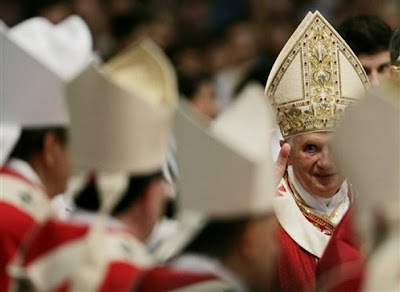 And he also tells us that only in communion with all the saints, that is, in the great community of all believers and not against or without it can we know the immensity of Christ's mystery. He circumscribes this immensity with words meant to express the dimensions of the cosmos: breadth, length and height and depth. The mystery of Christ has a cosmic vastness; he did not belong only to a specific group. The Crucified Christ embraces the entire universe in all its dimensions. He takes the world in his hands and lifts it up towards God. Starting with St Irenaeus of Lyons thus from the second century the Fathers have seen in these words on the breadth, length and height and depth of Christ's love an allusion to the Cross. In the Cross, Christ's love embraced the lowest depths the night of death as well as the supreme heights, the loftiness of God himself. And he took into his arms the breadth and the vastness of humanity and of the world in all their distances. He always embraces the universe all of us. Let us pray the Lord to help us to recognize something of the immensity of his love. Let us pray him that his love and his truth may touch our hearts. Let us ask that Christ dwell in our hearts and make us new men and women who act according to truth in love. Amen! 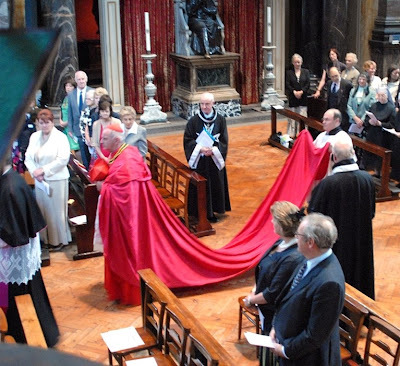 From the Birmingham Oratory this evening, we have a few photographs, courtesy of Mrs. Jackie Parkes, of the First Vespers of the Feast of Ss. Peter and Paul. 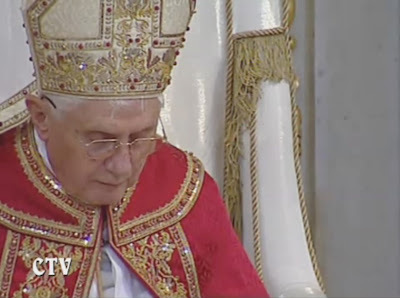 In a few moments, His Holiness Pope Benedict XVI will begin the celebration of Solemn Vespers - first Vespers of the Feast of Saints Peter and Paul - on the occasion of the conclusion of the Pauline Year, commemorating the 2000th anniversary of the birth of St. Paul, in the Papal Basilica of St. Paul Outside the Walls. Here is the booklet for those who want to follow along. Below you will find some images of the ceremony. The homily. 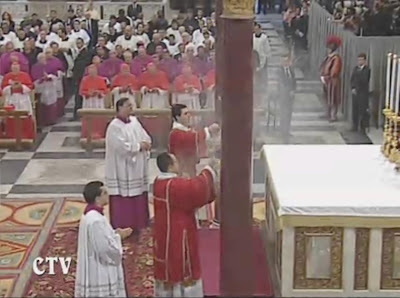 During the homily, the Pope revealed that a special minuscule probe has been inserted into the sarcophagus of St. Paul, which has never been opened, and a radiocarbon examination of a very small piece of bone retrieved in this way, along with traces of precious vesmtents and incense, has shown that the bones belong to a person who lived between the first and second century. 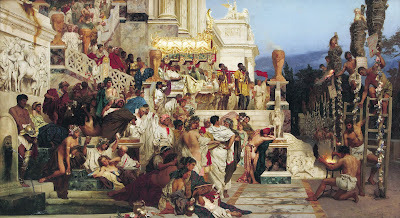 In the words of the Holy Father: "This seems to confirm the unanimous and undisputed tradition that these are the mortal remains of the Apostle Paul. All this fills our mind with deep emotion." Quite by accident, I came across this stunning photo of the Cathedral of Ss. Peter and Paul in Brünn, Czech Republic. According to the latest research, [the] beginnings of the church in Petrov go back to the 1170's. Later it was rebuilt in Gothic style and around 1500, during one of several reconstructions, its title of St. Peter was extended to Ss. Peter and Paul. During the Thirty Years' War the church burned out and was renewed in Baroque style in 1651-1652 and 1743-1746. In 1296 a collegiate chapter was established by the church and when Pope Pius VI established the Diocese of Brno in 1777, the church of Ss. Peter and Paul was elevated to cathedral. After an archaeological research in 1990's a Romance-Gothic crypt was opened for public. 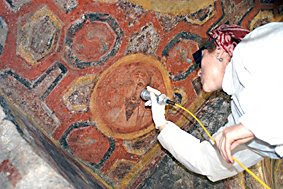 In 2005 permanent exposition called "Cathedral Treasury" was started. 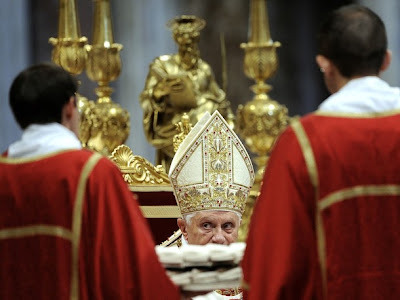 People can see there liturgical vestments, monstrances, chalices and other things that had been deposited before. The treasury is thus another place available for visitors of Petrov, beside Romance crypt and two towers that offer view of the city (from the southern tower) and of Pálava hills (northern one). 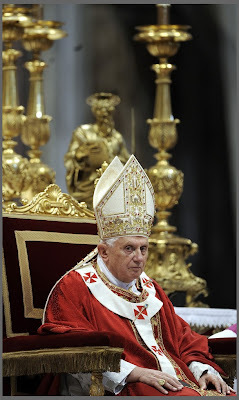 Pope Benedict XVI will be visiting the Czech Republic from September 26-28 of this year. This morning's Mass at the Sacred Music Colloquium was a Requiem Mass in memory of the deceased members of the CMAA, among whom Msgr. Schuler. Dies Irae was sung in octave alternatim by 250 people to create a beauty of enormous power. The ordinary was polyphonic, a setting by Spanish composer Joan Brudieu (1520-1591), a Mass that was only recently re-transcribed and has probably never been sung in the United States. It was sung with stunning elegance by the choir directed by Wilko Brouwers. 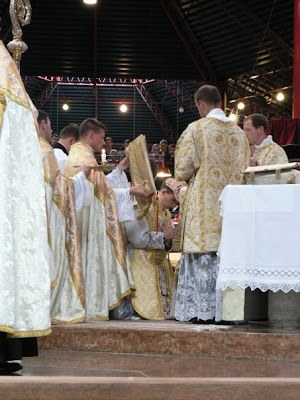 And yet, after all this music, and there was so much of it, and after a full week of unbelievable sounds in liturgy after liturgy, something interesting happened during the recessional. It was done in complete silence. You could only hear footsteps. 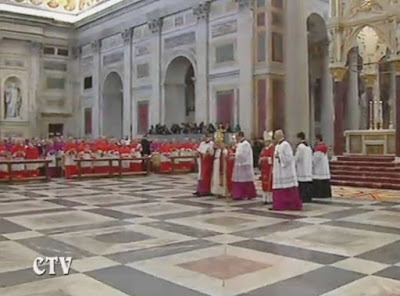 Even those sounds faded after a time and everyone slowly knelt and prayed for a long while. I was struck by a sudden and amazing irony that after a full week of the most magnificent music one can hear in a lifetime of listening, there was a special beauty to the silence. There was almost a sense I had that it was the most beautiful moment of the week, and my mind raced to John Paul II's talk about the importance of silence, and how little we permit it to live on its own during Masses today. Why are we so afraid to be silent? Maybe because of the messages it conveys that we don't want to hear? It is hard to say, but we do resist it, don't we? Its power overwhelms us, especially in this context. The silence reaches deep within us and calls us to something deeply contemplative, a profundity that can surpass everything else. Music has to be wonderful to improve on it and there are times when even the greatest music cannot improve on it. 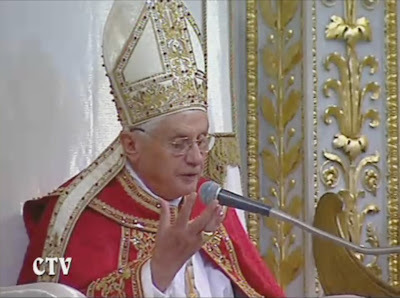 Those who understand German may watch the bishop delivering the excellent sermon on the centrality of the offering of the most holy sacrifice of the Mass in the life of the priest here.